This is an annoucement for the fair I will be attending next. The Southington Apple Harvest Festival is happening October 2-4 and 10-11, 2009. I will be there with my books October 10-11, that is the arts & crafts and books weekend. There will be free parking, free admission and free entertainment...can't beat that deal. Check it all out online. The holidays will be approaching fast...have children on your list? Come out and get a signed copy of one or more of my books...prices are less than online and the more you buy the more you get for free! Leaves are starting to change, it will be a great weekend to get out. This weeks challenge: The house lights dim, the curtain goes up… you’re on. I sat up and tried to look around. The smell in the dust-ridden air was horrible. My head was sore and soaking wet. My eyes felt like I had been asleep for days. “Hello?” I said using my hand as a visor to block the bright searing lights. “Who’s out there? Where am I?” I demanded. Suddenly out of the bright glow came an apple…bam! Right at my head. Then, as I was rubbing my head, came another piece of fruit, this time an orange…and it nailed me in the leg. “Booo! Booo! Do somethin’! Booo!” Roared an angry mob that I could not see. “What’s going on? Who are you? Why am I here?” I yelled out even louder than last time to try to be heard over the dissatisfied crowd. The white light switched to blue and now I could see some faint silhouettes. Here and there I could see a glow from a burning cigarette like fireflies exploring the night. I stood up but I couldn’t take a step. My feet were shackled to the floor. The light switched to red. I glared up at the source of it, blocking it with my hand. “Who’s doing that? What do you WANT?” I screamed again but with more rage. The silence was deafening. No one would answer me. The lights clicked off. It was pitch black. I heard footsteps, lots of them, growing louder and louder. They grabbed me and forced me down. I could hear the shackles being unlocked and then straps being wrapped around me. “What’s the matter with you?” Whispered a women’s voice. “Yeah – c’mon mate – quit acting all loopy.” Whispered another voice, this time a man. The grasps suddenly left my body and I heard the scurrying of them all rush away. Then the lights slammed on again. They seemed brighter than last time. I went to block the light but my arms were stuck. My legs were stuck. I started to rise from floor and rotate up facing the crowd again. The lights started flashing, red, green, blue, purple, in varying patterns and brightness. Then they started circling the room but I couldn’t follow them because my head was stuck too. I wiggled and squirmed in frustration and fear, trying to break free. Then whatever was holding me broke free, I lost my balance and started for the floor, backwards…boom the lights went out again. 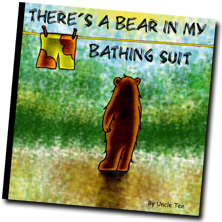 Click here to see the book trailer for my new children's book, There's a Bear in my Bathing Suit. It was chilly up on the hill overlooking the town. The cool breeze swirled in small funnels all around him. The ground was grassy and dry, too cold for annoying insects and the sky was clear. Vincent was happy he chose this night to capture the scene. After walking back and forth, searching for the right spot, Vincent had found his spot. He had his easel set up, his paints ready to go and he the stars were only getting brighter. They twinkled and flashed as he starred at them trying to image what they felt like and how far away they were. He could see that they were different colors but couldn’t quite create the exact color on his pallet. The gradient sky was a magnificent backdrop for the sleepy town. Below it, the rolling hills with the trees and houses at its feet. Dark shadows and dimly light candles filled the windows and streets. He knew he hadn’t much time to capture the landscape before night swallowed it in its darkness. The moon wouldn’t stop for Vincent to take his time, the time was now, and he had to paint fast. He transformed the canvas with such ease. Merging on it the image before him and the way that he saw it. The night went on changing, growing darker and colder until the moon left his canvas. The stars followed as hills and sky became one. Vincent finished and packed up his tools. He carefully lifted his painting off the easel and carried it back down the path that he came. That night he captured a scene that would never return and would never be exactly the same. 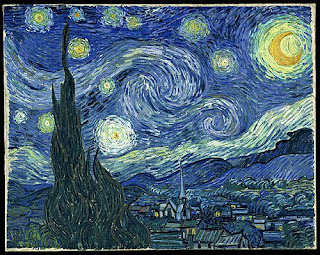 To Vincent it was just another starry night. This one is a little bit different than my previous eight books in that it is longer (40 pages) and it is not a rhyming book. Also I used a different drawing style...still drawn by hand but with a watercolor/acrylic type style. Reading levels up to second grade and a great picture book for preschool. Personal Note: I haven't participated in the last few weeks of [Fiction] Friday due to certain deadlines. I was trying to get ready for an art show and finish my latest children's book...which will be released in a few days. You can see all my books at my website. I am creating books non-stop, please take a look at them. This weeks challenge: Pick an ordinary object, and give it an extraordinary use. A cool breeze rushed through the crisp autumn air as the leaves slowly drifted down from the trees one by one. The sun cast long shadows through the thinning foliage. It was the first time in a week that the wet ground had any sunlight on it. David and his son, Tommy, were just finishing their breakfast. “The day for what?” Tommy asked. “Really, that’s what we’re goin’ to do?” Tommy asked with excitement. They cleaned up the table, put on their boots and coats and headed for the shed. David hunted around until he found the pump that he uses to get the water off the pool cover. David hung the pump over the edge of the pool cover into the cold, clear water and positioned it just right. He unwound the cord and ran it to the extension cord he had plugged earlier on their way to the shed. “Nothin’.” Tommy replied as he carried some rocks from the nearby wood line. He had the hose stretched out from where he was, around the pool and next to spot where David placed the pump. David connected the hose to the pump and followed it to the end to be sure it wasn’t kinked or facing the wrong way. Then he went back up to the pool and plugged it in. “Here it comes.” He yelled to Tommy. Tommy was holding the hose and a rock, trying to position it on top of another rock to be the start of his waterfall. He strategically placed and fitted each rock so that the water would move in exactly the direction that he wanted it to. Tommy was lost in his own world, manipulating the water as gravity pulled it down. His hands were ice cold from building the beautiful and complicated maze of rocks and flowing water coming from what most other people saw as just an ordinary garden hose. David walked back up to the pump. He was trying to remember what it was like to be Tommy’s age and taking regular objects and making them extraordinary. Hello everyone, this is an announcement for the upcoming art show that I will be attending. Jonathan Trumbull Jr. House Museum. "There's a Bear in my Bathing Suit". drawing style...still drawn by hand but with a watercolor/acrylic type style. If you have read any of my books, please feel free to rate, comment or review them here Thank you in advance.